Arrive in the charming capital city of Hanoi, known for its tree-lined streets and French colonial villas. Get acquainted with the history of the city visiting significant sites including the Ho Chi Minh Mausoleum, One Pillar Pagoda, Ho Chi Minh’s house and the Temple of Literature. Hop aboard a cycle and explore the maze of the Old Quarter’s ’36 streets of 36 wares’, named after the original 36 artisan guilds that date back to the 13th century. Meet with an academic researcher who will share fascinating stories from his trove of expert knowledge on Vietnamese history, culture, and ethnic peoples. 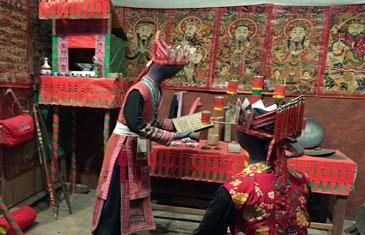 He will accompany you on a visit to the Museum of Ethnology which houses an extensive collection of traditional costumes and artefacts from Vietnam’s 54 ethnic minority groups. 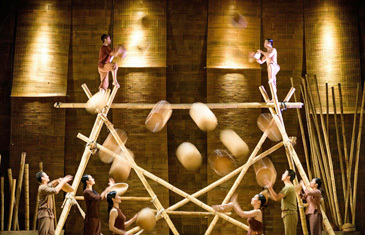 In the evening, enjoy watching a mesmerising performance of ‘My Village’, a dance and cirque show depicting village life in northern Vietnam. Depart Hanoi for a glimpse into the real Vietnam with hundred-year-old pagodas and spectacular, untouched scenery in Ninh Binh Province. Visit the Trang An Complex, a UNESCO World Heritage Site, and the ancient capital of Hoa Lu, the country’s first centralised feudal state from the end of the 10th century. A tranquil rowboat journey in Tam Coc unveils stunning limestone karsts jutting from the fields – a sight to behold! Immerse yourself in the peaceful countryside with a biking excursion through quaint villages allowing for up-close observations of daily life including farming and fishing. For lunch, join a local family in their home and learn how to prepare local specialities such as sweet potato cakes and grilled fish. Once the imperial capital of the Nguyen Lords from the 17th to 19th centuries, Hue’s splendid emperors’ tombs, ancient pagodas and the remains of the Citadel contribute to its undeniable royal charm. Visit the tombs of Emperor Tu Duc and Khai Dinh for insight into Vietnam’s history under their reign while also appreciating the ornate architecture and opulent interiors. 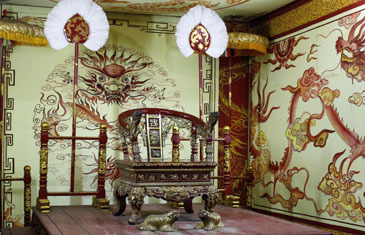 Feng Shui, the principles of spatial arrangement and orientation relating to energy flow, was an important factor in the design planning of the Imperial Citadel. Visit the Citadel and walk through the expansive walled city for a visual understanding of the application of Feng Shui in the architecture and landscape of the royal quarters. In the evening, enjoy a home-hosted dinner at the garden home of Princess Ngoc Son. A descendant of the royal family who currently lives in the home will share insightful information about life in the royal household as well as the Feng Shui elements of the century-old home. Located only 7km/4mi from Hue’s centre, Thanh Toan Village dates back to the 16th century offering a glimpse into how life was lived hundreds of years ago. 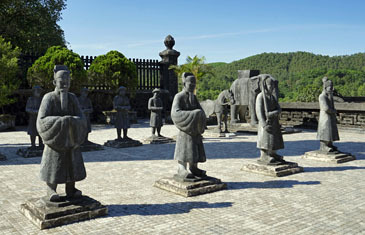 Afterwards, travel to the ancient Phuoc Tich Village. Situated by the O Lau River, this 500-year-old village is considered a national relic for its 30 houses which are more than a century old. Stroll through the village and visit a typical Hue-style traditional wooden house and a pottery workshop. For lunch, enjoy a home-hosted meal in one of the ancient houses and engage in lively conversation with your host. Drive along the spectacular Hai Van Pass, one of the world’s most scenic drives, and enjoy breathtaking views out to the East Sea as the road winds its way through the Annam Mountain Range. Arrive in the former trading port of Hoi An which attracted Chinese, Japanese, Dutch, Portuguese and Spanish merchants and sailors during its glory days. Today, this World Heritage ancient town is recognised for its well-preserved architecture, pedestrian-only streets and distinctive local cuisine, allowing visitors a glimpse of its illustrious past. Cycle along a path next to the Thu Bon River before crossing to the other side to explore one of a number of small islands just outside of Hoi An. Despite its proximity to the much-visited Ancient Town, Cam Kim Island feels completely removed from modern life on the mainland. Cycle on narrow paved roads passing houses and cottage industries such as boat making and mat weaving. Engage in small talk with the villagers who are always happy to see guests on the island. Cycle to your cooking class, located near the riverbank, where your host will begin with a brief introduction to her family’s history. Take part in the interactive cooking class and afterward, pull up a seat in the restaurant and enjoy the dishes you helped prepare while taking in lovely views of the river. My Son, located 39km/24mi from Hoi An, is the former capital of the ancient Champa civilization which ruled Central Vietnam from the 2nd to the 13th centuries. Learn about the history of the Champa civilisation on an excursion to the UNESCO World Heritage Centre of My Son. The spiritual centre of the Kingdom of Champa, My Son is home to Vietnam’s most extensive Cham structural remains with 20 temple towers still standing today. Arrive in Ho Chi Minh City, Vietnam’s dynamic financial centre with a population of 13 million people. 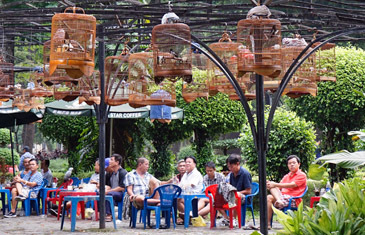 Despite being a modern metropolis, Ho Chi Minh City retains much of its fascinating connections with the past. Enjoy a half-day city tour for an overview of the city’s historic landmarks from the unique vantage point of a vintage sidecar motorbike with chauffeur. Finish the tour with a visit to the War Remnants Museum for a vivid perspective of the American War through the eyes of the Vietnamese. 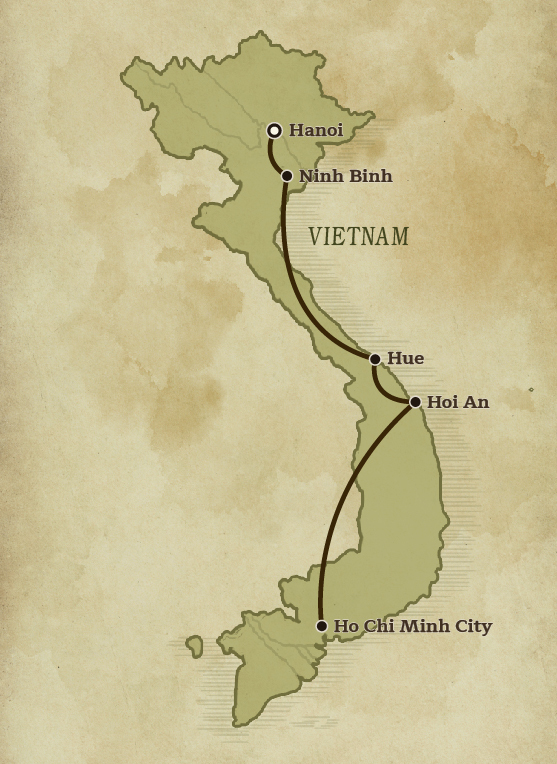 For even more on Vietnam-American history, travel to Cu Chi to visit the famous tunnels built during the war by the Viet Cong. Touring the extensive underground tunnel network will provide a better understanding of the Vietnamese resilience during combat despite the incredible hardship of life in the tunnels. Life in Saigon begins early before the heat of the day sets in. See how local Saigonese get their day started, exploring this vibrant city in the early morning hours. Zigzag through local streets to reach the city’s largest flower market and continue to Tao Dan Park to watch or take part in some morning calisthenics including the graceful movements of Tai Chi. Later, join an American architect and researcher as he shares his insight into the modernist architecture movement, with visits to some key examples of modernist designs including the former Presidential Palace. On your last evening, enjoy a thrilling ride on the back of a Vespa to experience Saigon by night, visiting some popular eateries and social hangout locations for a truly memorable adventure!